These boot cuffs measure 4.5 by 5.5 inches. They are crocheted in a simple stitch pattern and can be whipped up in no time. And although they are given in one size only, the pattern is easy to adjust to any size you need from toddler to adult large. 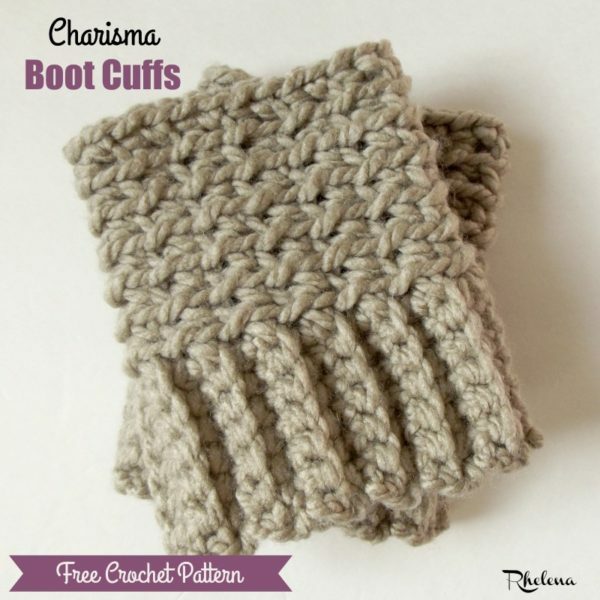 Here is a crochet boot cuffs size chart. They are pictured here in a chunky yarn, which will keep you nice and cozy; but since they are so easy to adjust in size you could basically crochet these in any yarn and hook size that you want. The only thing to remember is that you might need to experiment with your hook sizes as you want the ribbing to be the same size or a bit smaller than the body. And if you enjoyed these, you might also enjoy more designs in the Charisma series. Gauge: Approximately 1.5″ over 2 (sc, ch 1). Finished Size: Laying flat they measure 4.5″ wide by 5.5″ high. Rows 2-26: Ch 1, blsc in each st across. Turn. (6 sts) Continue with this row until you have reached a desired circumference making sure to end in an even number of rows. Ch 1 and join the ribbing rows by slip stitching the last row to the free lps of starting chs. Rnds 3-7: Rep rnd 2 until you are about ½” from desired height.